Rona Taylor; Judi Hibberd; Janet Hickinbottom; John Levett; John Nisbet, Bron Putnam and Mary Webb. Rona welcomed everyone and thanked Judi for hosting the meeting. Apologies had been received from Andy Gibbs, Marlene Hills, Cllr Archie Taylor and Faith Ward. The minutes of the last meeting of June 19th 2012 were accepted. Most Matters arising were to be covered by the agenda. 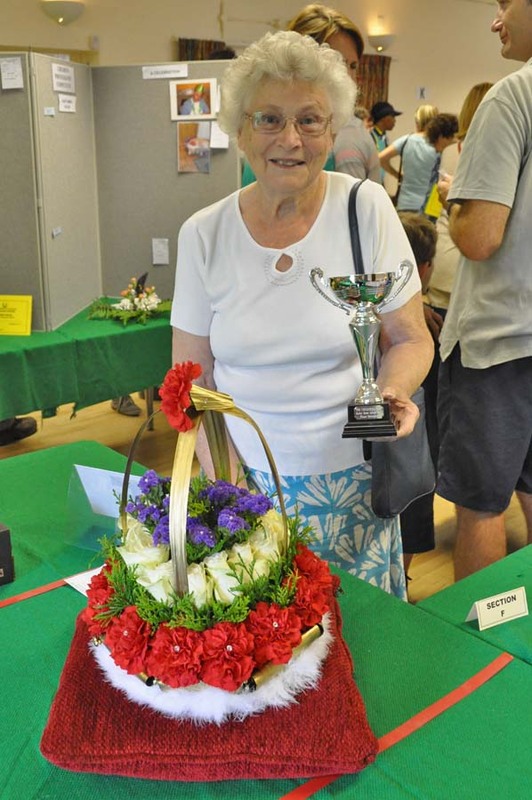 Parish Clerk: The new Parish Clerk, Mrs Louise Baudet, had been appointed. Rona reported that Cllr Taylor would be attending the meetings to provide this necessary two-way liaison but on that evening he was ill.
As agreed, Rona had issued the Chair’s Report with the Bugle so that this item would not take too long to report at the AGM. 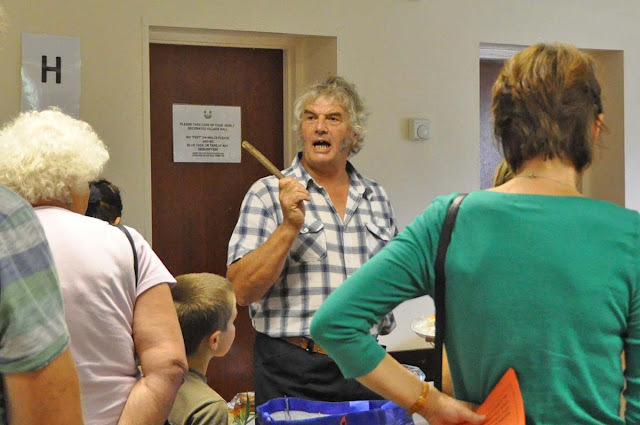 Although it had been hoped to distribute copies of WCC Local Plan to residents, there had been insufficient copies available for this purpose. 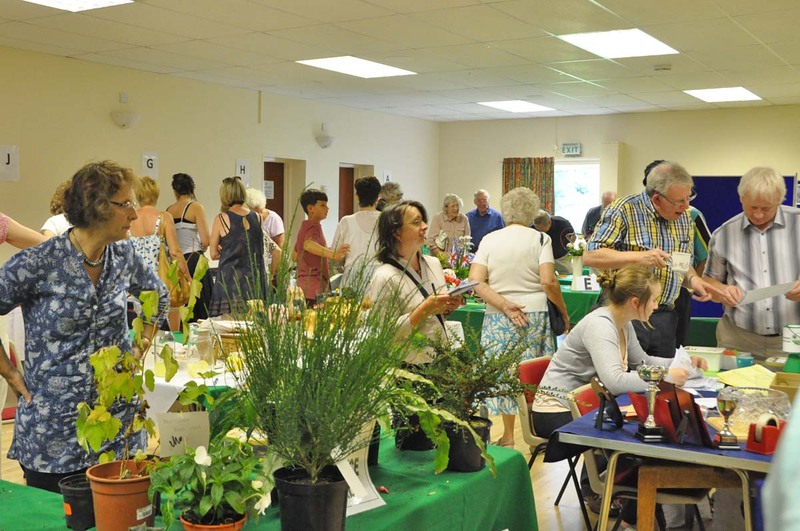 The possibility of an Open Gardens weekend in 2013 was still to be discussed. It was reported that Mrs Joanna Illingworth had offered a rose bowl to the village and suggestions were sought for its use as an award. Committee minutes were now being sent to John Webb for inclusion on the Burton Green website. Kathryn had chaired the steering group and a first meeting had been held where the outcomes of the June village meeting were considered. Some excellent ideas had been proposed. Two Parish Plans had been considered as models and themes had been selected. These were divided between members of the group and questions were being created around each theme to form the basis of the all important questionnaire. The aim was then to gain feedback. People in the village with areas of expertise would also be consulted. It was important to remember that this was not a Residents’ Association initiative but one for the whole community. The Bugle and John Webb's website would be used to publicise it. 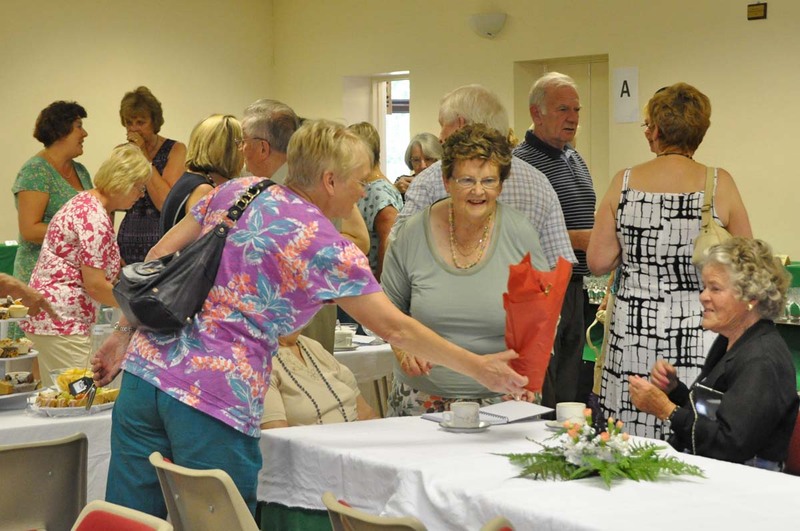 Kathryn reported that all was well with the Village Hall. 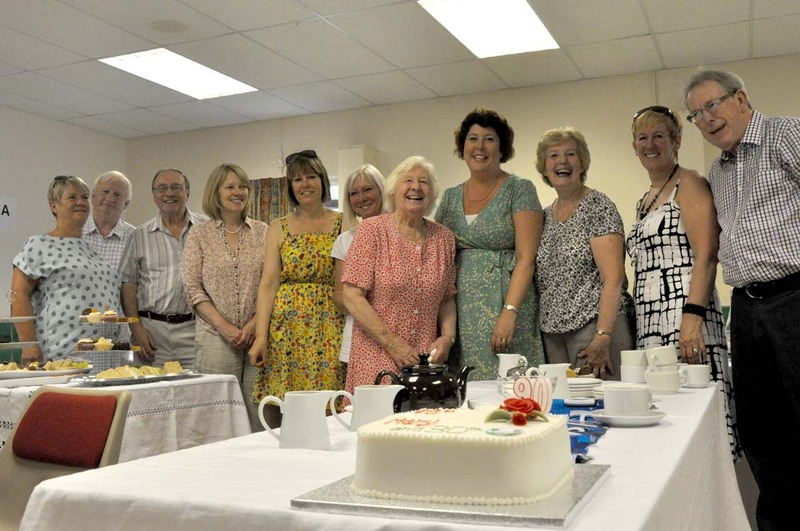 On the previous weekend the Hall committee had celebrated its 30th anniversary with former committee members. Also, the Produce Show was a success although less produce was displayed because of a poor growing year. 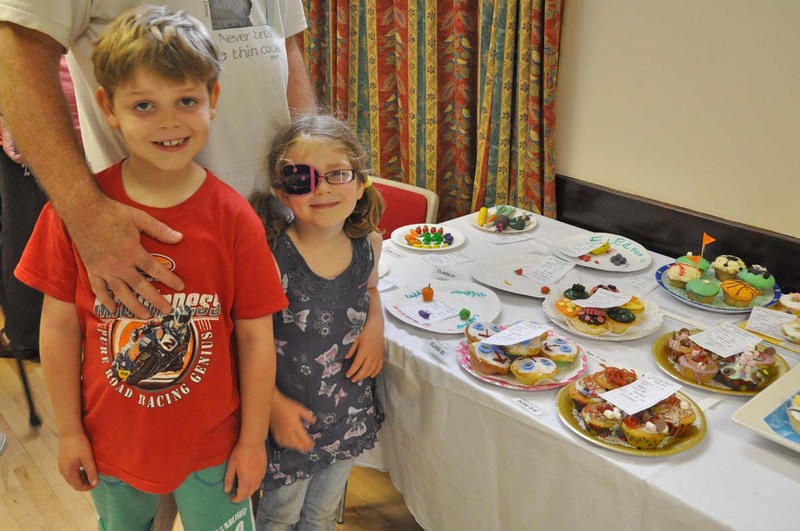 Two new people had volunteered to join the Village Hall committee. Thanks were extended to all who deliver the Bugle. Personal contact made while collecting voluntary subscriptions was considered important. Since the meeting in June matters of mitigation had been dominant and the proposal of a deep bored tunnel had been presented. Jeremy Wright MP and Caroline Spelman MP were both supportive of this work. Rona had sent a letter via Jeremy Wright MP to Justine Greening whilst she had been Transport Minister and a reply had been received. This said ongoing talks could be held until the hybrid bill as the “design freeze” would no longer take place in November. Solihull council was now on board and had met with engineers to look at a tunnel proposal. Their tunnel proposal would move the line significantly away from the Greenway. At the recent HS2 Ltd Community Forum, poor feedback from HS2 Ltd had continued. Matters of an electricity station in Hodgett’s Lane and construction sites in the area were raised for the first time. Temporary roads, for example one initially suggested from Cromwell Lane to Hodgett’s Lane, had disappeared from maps but without any understanding of whether they were still planned. The Action Group had employed an expert who had attended the bilateral talks and he had suggested the plan for a bored tunnel was viable. John Levett explained the route of the proposed tunnel would start near Crackley on Warwick University land and appears beyond Blooms Garden Centre in Balsall Common. 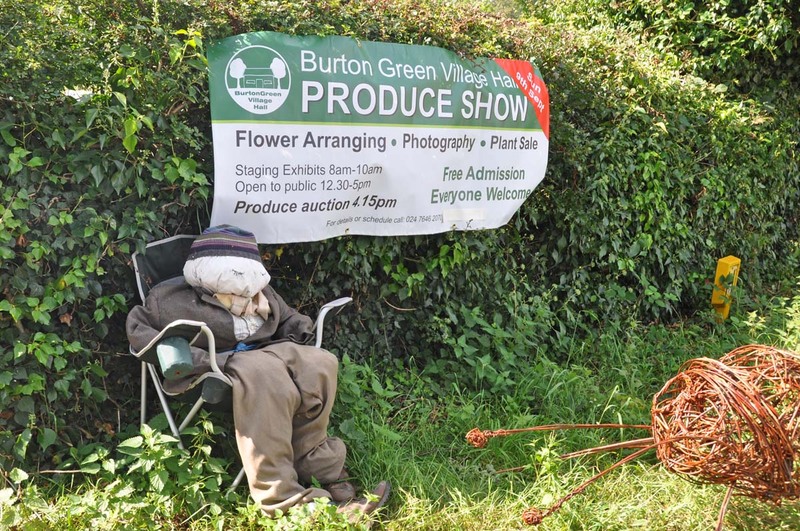 Rona wondered if the Forum was too big and if a Burton Green Forum was necessary but it was explained that the Forum itself had chosen to remain the same. 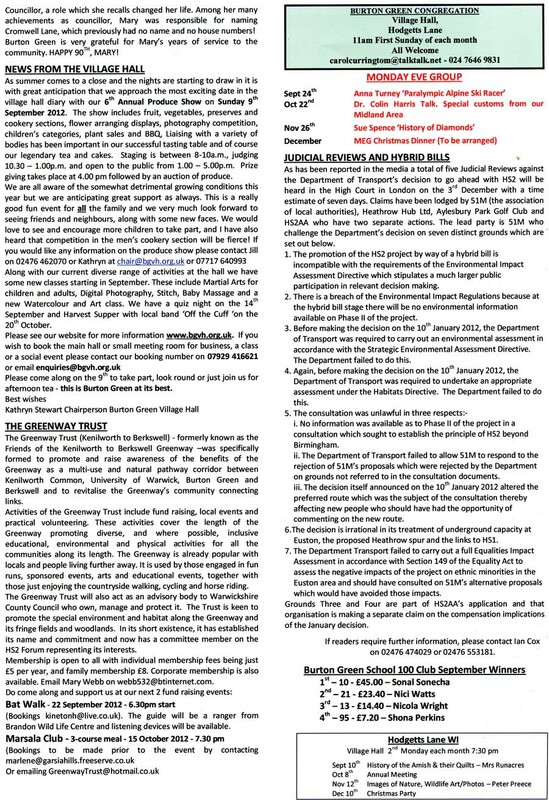 HS2 Ltd had said at the Forum meeting that they would reinstate the Greenway after construction. WCC was collating all documentation for Warwickshire including submissions. There was now a new Secretary of State for Transport (Patrick McLoughlin) and the new Minister of State was Simon Burns. Jeremy Wright was now Parliamentary Under Secretary of State for Justice. Mary reported that £93 had been collected from advertising in the recent issue of the Bugle. There was much discussion about whether “What’s On?” items that included commercial operations should be charged for inclusion. There were strong feelings expressed on each side of the argument and a vote was carried by a majority that those involved should be asked for a small donation. Questions were asked about funding the Bugle. 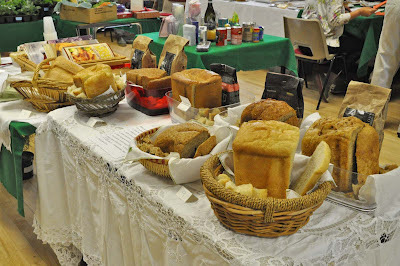 BGRA received a grant from the Parish Council plus income from advertisements. Mary explained that it was necessary to offset costs without making a profit. It was hoped that future planning would mean fewer bulletins would be necessary in between actual editions of the Bugle. It was agreed that the current format should be retained and Mary was commended for her sterling work in producing this vital communication tool. The agenda had been drawn up and was discussed and it was noted that an item on the Village Hall had been inadvertently omitted. As reported already, the chairman’s report had been issued in advance. It was hoped to explain more clearly the distinction between the roles of the Residents’ Association and the Parish Council. The constitution said that all post holders plus three committee members had to stand down but could be re-elected. The office holders, Bron Putnam and John Nisbet would do this but John Levett wished to stand down without re-election. He would be greatly missed after so many years of service on the committee. There would be two spaces to fill on the committee. Marlene wished to stand down as Treasurer at the AGM. Terry Hayes had volunteered to take on the role if elected, after his retirement in December. His committee membership would be proposed at the AGM. The committee approved a proposal that Rona and Mary should “bridge the gap” from October to December. It was agreed that the village email system would be used to ask for others interested in joining the committee. 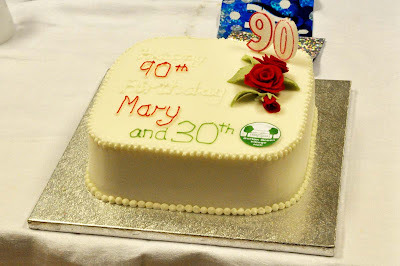 Mary and Rona would deal with the refreshments and John Levett agreed to set up the IT requirements. Rona reported that Martin Stacey of WDC with responsibility for the environment and Nick Hillard Chair of the Greenway Trust had been invited to speak. 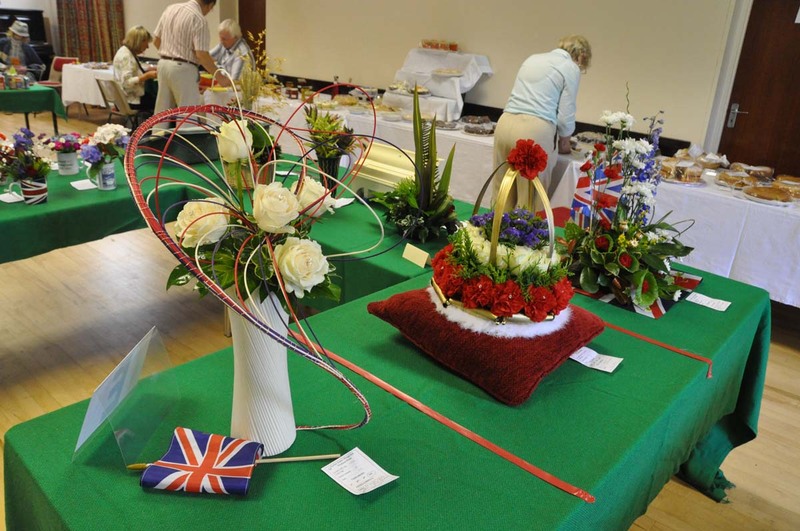 Judi would arrange hire of the hall for 2013 AGM. There were now eight people on the Speedwatch team and training was to be held in October. 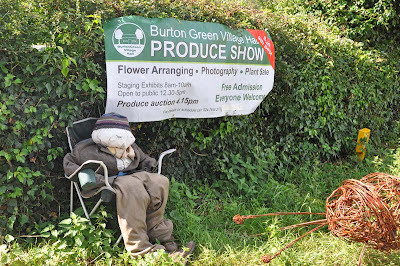 The equipment was to be kept in Burton Green. High visibility vests were being applied for via Kenilworth Community Forum. Nick Hogue from Cromwell Lane had joined the forum in Kenilworth about cycling in the area and had attended a series of meetings. Recommendations were to be made to the Council in December. The 15 people on the group were looking at such matters as etiquette on the Greenway; a cycle track in Abbey Fields etc. There was potential for a match funded grant from government if any ‘blackspots’ were identified. Mary had requested funds from a Coventry charity and £500 for a box and fittings from the Kenilworth Community Forum. Rona had received a report. As already mentioned, a Parish Clerk had been appointed from Coleshill as a result of which the meetings had needed to change to Mondays when she was available. Had responded on the Local Plan and accepted category 2 status. Expressed strong support for a peri park. Was anxious to establish close links with other local organisations within the village. Unpresented/cleared cheques to be deducted from above. Invoices yet to be received for Bugle printing and AGM material plus Village Hall rental. 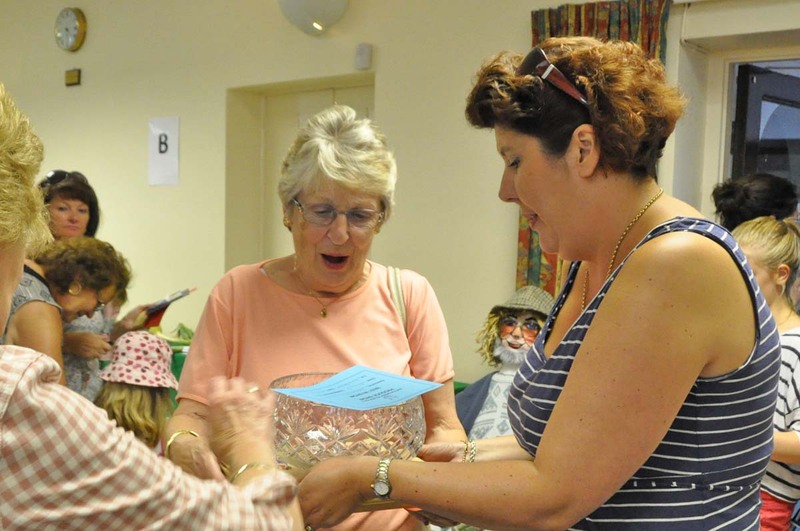 Marlene said: “We had received a lovely thank you note from Peter Tacon at BGVH thanking the Residents’ Association for their kind donation following the Fund Raising on Jubilee Sunday which the Residents’ Association did. The Greenway Trust has also sent a thank you for the kind donation. Both organisations helped on the Sunday. I would also like to thank Mary Webb for organising the subscription collection and for doing so many patches. I would also like to thank the collection team for their work in collecting the subscriptions this year. The envelopes posted through the letterbox has been very helpful and made things a lot easier. Without the collection of these subscriptions, the Residents’ Association cash flow would be significantly impaired”. Transport: Rona said there had been some problems with a Thursday bus being oversubscribed. It was also noted that the bus did not accommodate wheelchairs and Cllr Whitehouse would be pursuing this issue with the Local Authority. Constitution: It was agreed that at the next meeting the Residents’ Association constitution should be re-visited with a view to updating it. Water: A water leak in Cromwell Lane had now been repaired. Welcome pack: It was agreed to re-visit and review this at the next meeting. Footpaths: Concern had been expressed regarding footpaths in the village and a voluntary survey was being undertaken. Roads: Potholes were regularly reported and one in Crackley Lane was currently of concern. 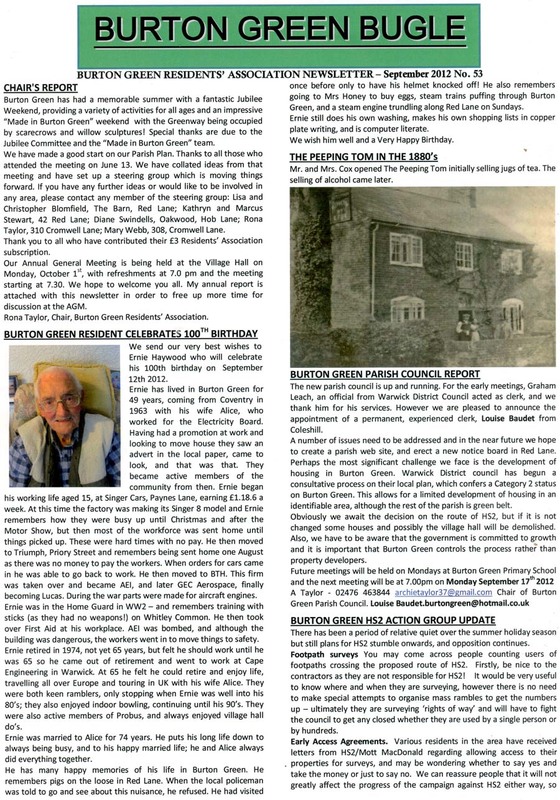 Bugle: Publication dates for 2012/13 would be decided and circulated to the committee. Subscriptions: It was decided not to pursue any outstanding contributions as these were intended to be voluntary. Thanks were again expressed to all those involved in their collection. Security: It was noted that a range of security equipment was now available to view and purchase at Town & Country Furniture in Kenilworth, thanks to Burton Green resident Andy Jones. John Levett would mention this at the AGM. 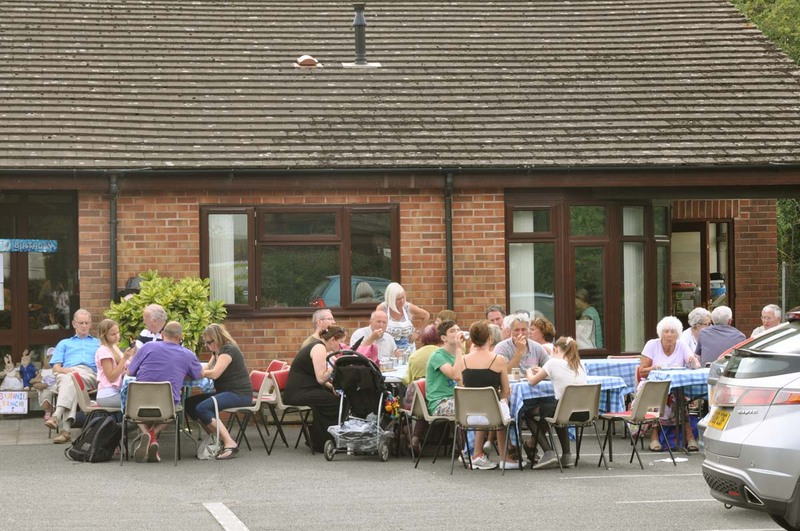 Communication: It was agreed that when any events were arranged concerning the Residents’ Association then all committee members would be informed in advance. HS2: It was agreed that the new Transport Minister should be asked to visit the Village and Rona agreed to write to him. Thanks were expressed to Janet for always doing the minutes so efficiently. The next committee meeting would take place on November 27th at 7.30p.m; venue to be finalised. 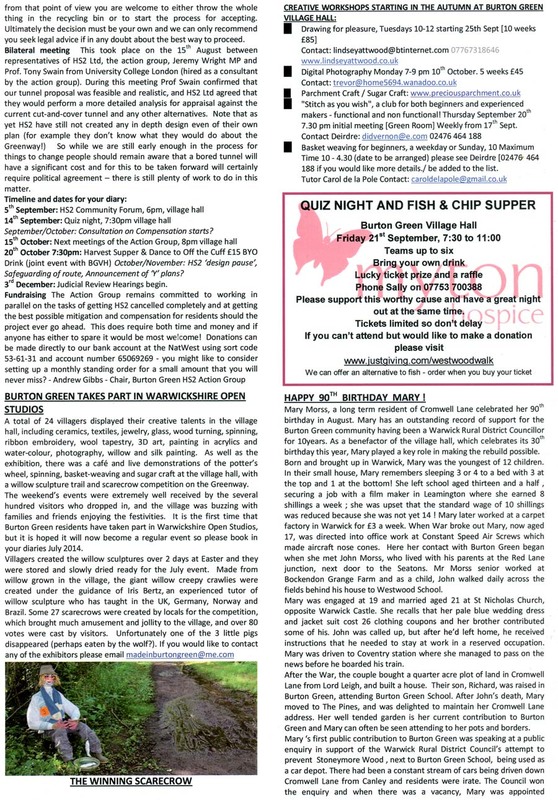 The September 2012 edition of the Bugle has been published. 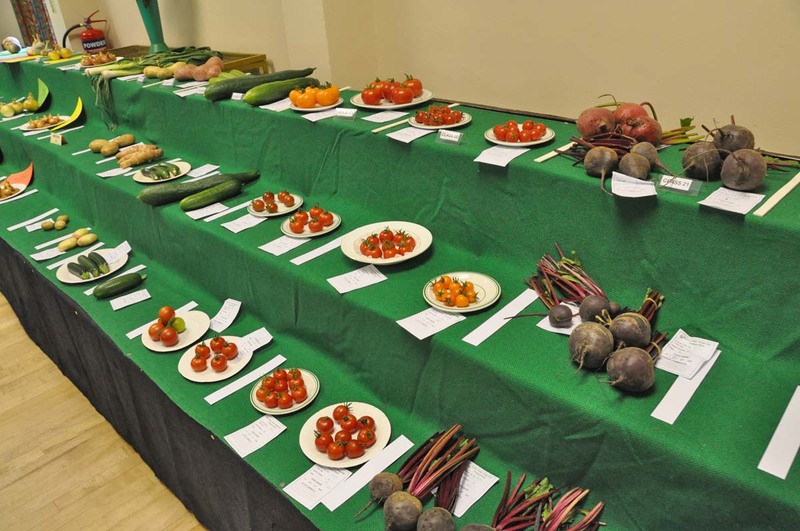 The 2012 Produce Show was held at the village hall on Sunday September 9th. Floral arrangements on the theme of Jubilee Year. Some of the proud prize-winners. Glass bowl being presentated for special merit (to the lady in the centre). On Saturday, September 8th 2012, the Village Hall celebrated its 30th Anniversary. 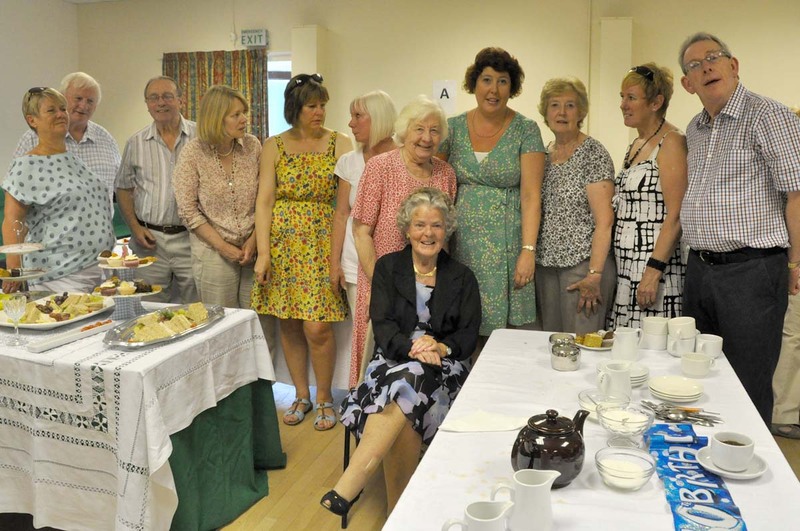 A number of people who had a significant role in the construction and early life of the hall, took part in a small reunion. The occasion was attended by Mary Morss (seated far right), who was originally responsible for the construction of the hall, and who recently celebrated her 90th Birthday.